According to German law I have to declare that I'm not responsible for the content of external links. Der Autor dieser Seite ist nicht verantwortlich für den Inhalt von externen Links. "Why struggle over reams of abstract code when you could walk though the architecture instead? " That's the question we've asked in several ABAP software development projects. Finding an answer on this question took about 3 years but finally we think we have to publish the results to the ABAP and SAP development community. The current release mySAP ERP 2004 consists more then100 million lines of code. A mass of code that has to be managed and understood. To achieve an in depth understanding of how business processes are implemented within mySAP we developed a new system called Magellan Explorer to analyze mySAP ERP business processes according to there source code. 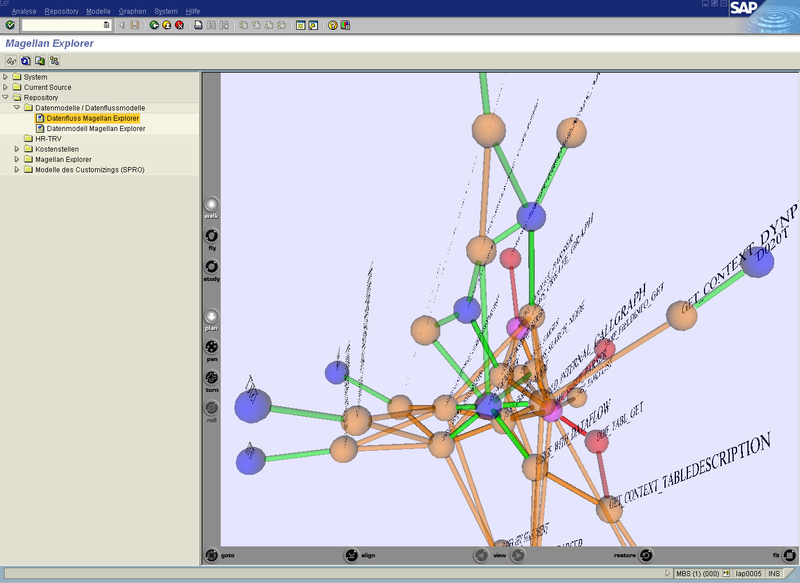 Based on a final thesis in computer science this is the first time a software visualization tool was used to analyse a system as complex as R/3. Feel free to have a first look at the results.